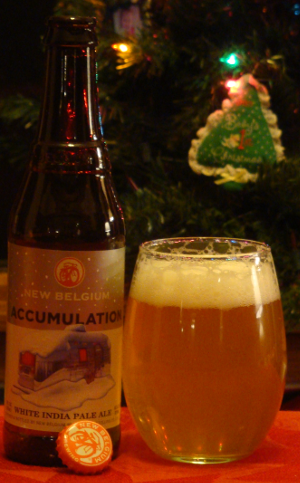 From New Belgium Brewing Company in Fort Collins, Colorado, tonight I’m tasting Accumulation, a white IPA. Accumulation pours a lightly hazy pale blonde color. The head is bone white and a little spongey. The aroma is quite mild, just a bit of herbal hops and a light bready maltiness. An interesting herbal hop bitterness leads the flavor, but fades somewhat into a mellow herbal flavor that doesn’t last long. A malty sweetness lasts, turning a bit cloying. The body is full, a little much given how mild this beer is. And, Lo! The Wench declared that Thursday, 4 August 2011 be the first annual International IPA Day. And it was so. And the people saw that it was good, and they celebrated. Practically everyone in craft brewing will be drinking India Pale Ale today. Tonight I will continue to represent my new town with a beer from one of the “other” Brooklyn breweries, Sixpoint Craft Ales. 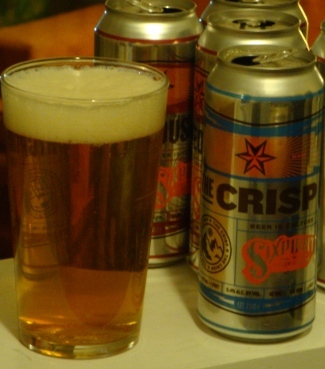 Sixpoint is one of those places that’s two parts good beer and three parts mystique. But they know how to hide a good pun. And they have cans. I’ll taste the Righteous Ale, a beer which marries the flavor of hops and rye. 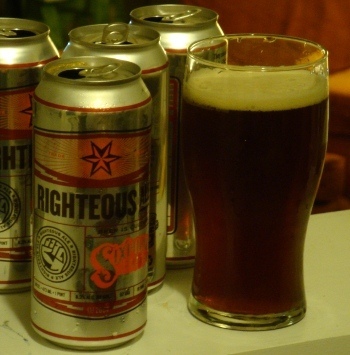 Righteous Ale pours a ruddy caramel color, quite hazy, with some creamy tan head. The spicy rye character is prominent in the aroma. Fruity and herbal hop notes compliment it well. Just a hint of caramel malt sweetness adds to the remarkably complex nose. The flavor is likewise quite complex. The rich spiciness of the rye blends assertively with the hop bitterness. A solid malt backing supports with bread, caramel, and toast flavors. The herbal hop character leads the tongue right back to the rye, forming something of a flavor cycle. The body is just a bit too heavy, with a sweetness that lingers on the tip of the tongue, where the rye bite should be. Apparently tonight, in downtown Iowa City, there was a major throwdown of Iowa-made India pale ales. You probably haven’t heard about it, and even if you had, you would be hard pressed to find any information at all. The only reference on the series of tubes seems to be a tweet from Short’s that it is happening either during or as a part of the Top Chef of Iowa City. This event is being put on by the Downtown Association of Iowa City, and features chefs battling it out for culinary champion as well as bartenders showing off their most “creative” cocktails. Short’s Burger & Shine has been making waves since they switched all of their taps to Iowa-made beers last year. Apparently, with this challenge they were hoping to capitalize on the recent growth of Iowa craft beer and an already-planned foodie event. I would argue that they made three critical errors in calling for this competition. Second, the venue. The Top Chef event is tied in with the Downtown Association’s annual meeting. Surely the focus at that meeting will be on the operations of the association. Where the entertainment comes into play, it is reasonable to assume that the stars of the show will be the chefs and bartenders, since that is the competition that has been advertised. Finally, the audience. I would expect that the majority of the attendees of this evening’s events are members of the association hosting the meeting. These are businesspeople, not beer aficionados. These are people who purchased their tickets over a week ago to an event that, at the time, had no beer elements. An Iowa IPA Challenge is a grand idea, but it must be held where all beer lovers can take part. 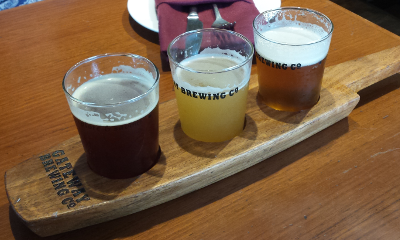 Enough complaining, let’s try some beer. Tonight I will be tasting four Iowa-made India pale ales. My review of Millstream Iowa Pale Ale is almost two years old, so I’ll re-rate it, but I just tasted both of the Peace Tree IPAs a few weeks ago so we can let those reviews stand. This all means that my Iowa IPA Challenge has twice the number of entrants of the “official” one. First up, the Iowa Grown I.P.A. made by Madhouse Brewing Company in Newton. Since it is made with Iowa-grown hops, I picked up this beer for a post I will be doing soon about local ingredients, but it seems fitting to rate it today. The Iowa Grown IPA pours a burnt orange color, nearly clear, with some creamy white head. The nose is simply not hoppy at all. There is a caramel malt character like raisins that borders on vinous. 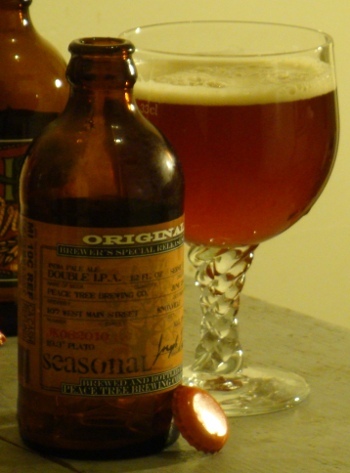 There is some hoppiness to the flavor, a deep, earthy grassiness. But the hops contribute minimal perceptible bitterness, and no strong, clean flavors. The caramel malt character carries through, maintaining the raisin and vinous flavor. A residual sweetness would balance the hops if they were there. The carbonation is a bit too intense. The flavor is unsettling, and not just because you expect to taste an IPA. This beer hasn’t really ever heard of the style. 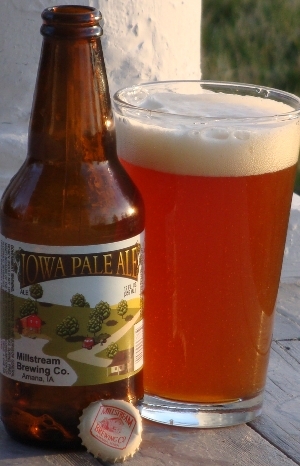 Now I will taste the Iowa Pale Ale from Millstream Brewing Company in Amana. The Iowa Pale Ale is a very hazy pumpkin orange color. The buff-colored head is creamy and generous. The hops make the aroma citric and astringent, like the contribution of orange peel to a Belgian wit. Otherwise the nose is barren, with almost no malt character and no readily identifiable hops. The flavor is mild and citric, as the aroma would indicate. The astringent citrus character continues to lend a Belgian wit quality to the beer: were it not for the color and body, you might mistake this for a witbier. There is a thickness to the palate and some residual sweetness; however, there is no rich malt flavor to justify it. This beer had a friend once who knew what it was like to be an IPA. Next up, the double IPA from Millstream, HOP2, which has the dubious honor of having the worst label of the group. Even for Millstream this label is bad. Just look at it. No wait, don’t. The HOP2 pours a copper-tinted auburn, opalescent, with some creamy off-white head. The nose of this beer, like the regular IPA, is disturbingly citric, in this case more like lemon peel. There is also an unpleasant character that I could name, but won’t here for the reader’s sake. It’s mild, so hopefully you won’t pick it up. There is a bit of a caramel malt character, but hardly any. The flavor is simply unpleasant. There is a medicinal alcohol flavor, which could be the result of either of two major issues. First, they might be stressing the yeast past its point of comfort, in which case they would simply need to switch to a new strain. My suspicion, however, is that this flavor comes from the use of hop extract, used to try to boost the hop flavor and bitterness cheaply. If you can get past this off-flavor, the beer is not too bad. 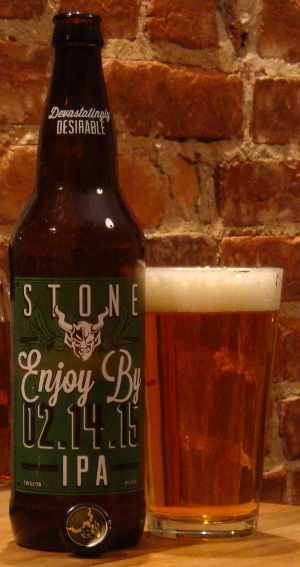 There is a decent grassy hop character, as well as some sweet, toasty, caramel malt flavor. But those are hard to detect behind the sharp fusel alcohol bite. This beer probably read the Wikipedia article on India pale ale. For my last Iowa-made India pale ale I had to step out. I headed over to Devotay to try the Golden Nugget on tap. This IPA is made by one of the newest Iowa breweries, Toppling Goliath Brewing Company in Decorah. The Golden Nugget pours a lightly hazy pale straw with some bone-white head. The nose is mild, but pleasantly so. The Nugget hops certainly come through, producing a lightly fruity and earthy nose dominated by grapefruit and pine. There is just the faintest malt aroma. The taste follows the aroma: the pine and grapefruit from the hops give a rich hoppy foundation. Some bready malt begins to balance, but this beer is very dry, so the bitterness starts to get away again. There is just a bit of a sweetness or richness that is soon overtaken by the lingering bitterness. The Golden Nugget isn’t too hoppy, it could just use a bit more malt to balance it out. Now here is a beer that understands what an IPA really is. Well, if you add to this discussion my ratings of the two Peace Tree India pale ales, I think you have a pretty good overview of the Iowa craft brewing scene. Take that how you will, but I’m content looking forward to more beers from breweries like Toppling Goliath and Peace Tree. Alas, this is the final post in my triptych on Peace Tree Brewing Company of Knoxville, Iowa. Tonight I’ll have the last pair of beers currently available (outside of the brewery’s taphouse), two India pale ales. Fortunately it won’t be long before I can try more: a little birdie told me there’s an imperial stout coming in just a few weeks, and a Belgian blonde soon after that. First up, the year-round Hop Wrangler 3, termed a “multinational IPA” for its combination of English and American malts and hops and Peace Tree’s Belgian yeast strain. Creamy ivory head sits atop a pale, rusty, lightly hazy beer. The hop aroma billows out, strongly fruity, with herbal undertones. Grapefruit, mango, and blood oranges intercut with pine and rose blossoms. Aromas of lemon and mint float above it all. The bitterness is immediate, and though it is strong it’s also rounded and full, accompanied by a rich herbal hop flavor and just enough alcohol to notice. 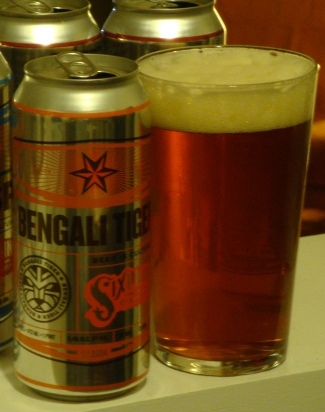 The spicy pine and mint of the English hops are joined by grapefruit from the American ones. A bit of a caramel malt sweetness in the background, and a bit of substance to the body, but overall not quite malty enough to provide the balance I would like. From the Brewer’s Special Release Series (to my knowledge this beer is the series at the moment), I’m having the Double IPA. You know this beer was brewed at Peace Tree: it says so three separate times on the label. The double is a bit darker in color than the Hop Wrangler, more of a mahogany, opalescent, with some off-white head. 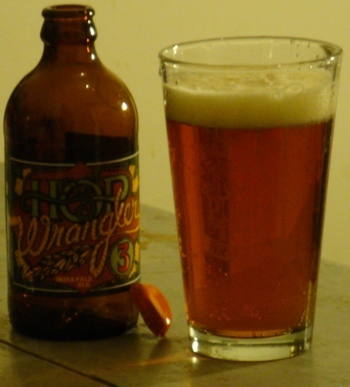 The nose is strongly fruity with grapefruit and mango, as well as a piney herbal character, much like the Wrangler. However this one has a rich toasty maltiness that the other is lacking. The difference between these two beers on the nose is not all that significant, but the flavor is worlds apart. 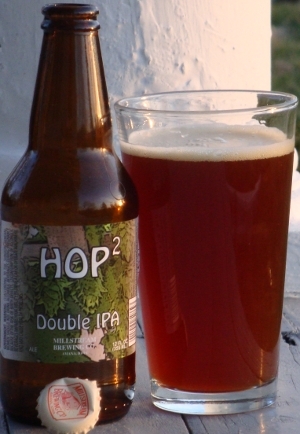 The Double IPA has a solid malt character to balance the ridiculous hoppiness. The hops are still certainly the star: their exotic fruits and mint have an almost shisha-like quality, and the herbal character provides a grounding force. But the malt is not being pushed aside here, lending a flavor that reminds me of Hawaiian sweet bread, and creating a luscious body that handles the hops. Tasty. Peace Tree has been making good beer and making it available, but not for very long. They stand in defiance to those who say the craft beer market is already saturated, proving that elbow grease and a little innovation is all it takes to carve out a niche and watch it flourish. If they can keep it up, they’re poised to go very far. Last week was SF Beer Week. I understand there were a few good events all over town. Unfortunately I left just before it got started. Also, all month long is the Strong Beer Experience at the Magnolia Pub and the 21st Amendment Brewery. I did stop by the latter for the three drinks I was allowed (it seems like a good idea that they have set that limit) and enjoyed them. It was a bit too crazy in the bar to take good notes, but I know I was a fan of the Imperial Jack, a beer which I understand was guest brewed by the folks at the Elizabeth Street Brewery. 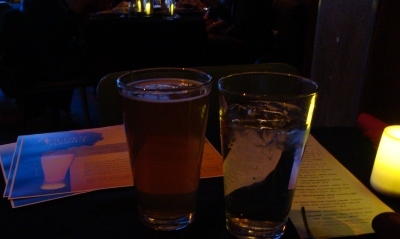 I had two beers while at Thirsty Bear, a gravity-served stout and the IPA. The Cask Stout was absolutely pitch black, a black hole shade of black. The long-lasting creamy head was a deep ochre hue. First on the nose are light roast notes from the dark malts. This is followed by hazelnuts and nutmeg, and subtle aromas of toast. Overall light, but with an intriguing fruitiness. Toasted and burnt bread flavors and some smokiness betray the roasted malts, but the smooth creamy palate is much lighter. 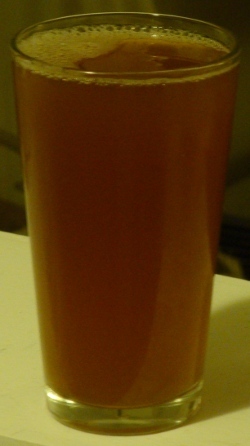 As it is a cask beer, the carbonation is very mild, allowing the roasty bitterness to become somewhat more astringent. The bartender recommended the Howard St. IPA, and I can’t refuse a hoppy beer. This one is brilliantly clear, the color a beautiful ruby tinted amber. It has some creamy head and an herbal nose with hints of citrus. The hoppy bitterness is strongly herbal, bordering on the character of a California common ale, but there isn’t the same long lingering bitterness on the back of the tongue. The herbal hop flavor leans towards minty. The flavor is just a bit green, dirty but not very earthy. It has some body, but is perhaps a bit thin for an IPA.